Two tourbillons, a 100th of a second chronograph and a bold, futuristic design. 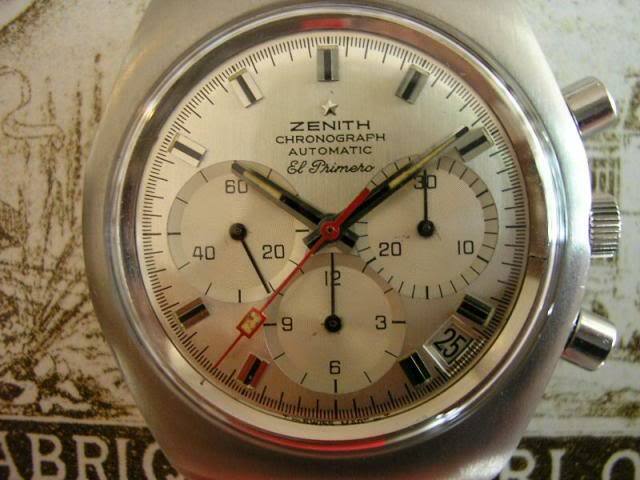 High-frequency chronographs have long been part of Zenith’s identity. 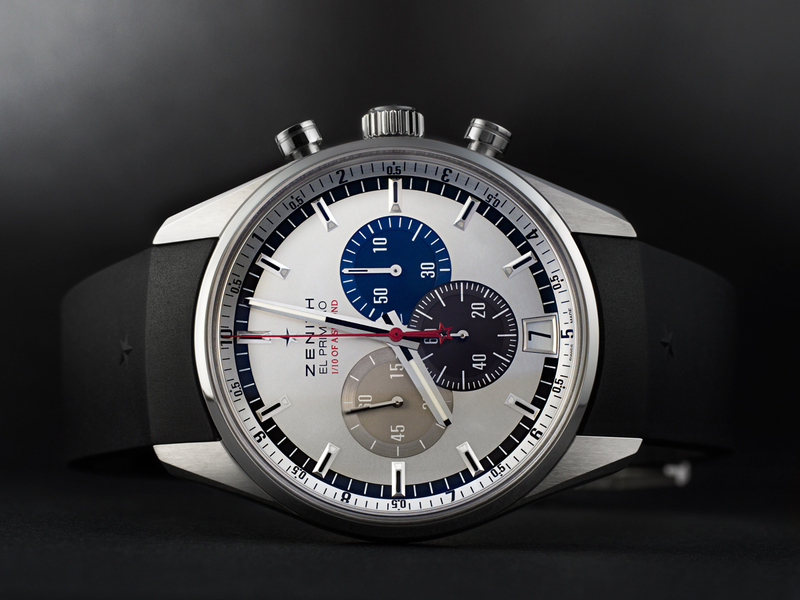 It all started in 1969 when Zenith introduced one of the best and most accurate chronograph movements ever created, the iconic El Primero. Fast forward to 2017, when Zenith introduced the Defy El Primero 21, an innovative chronograph with two regulators, capable of measuring hundredths of a second. 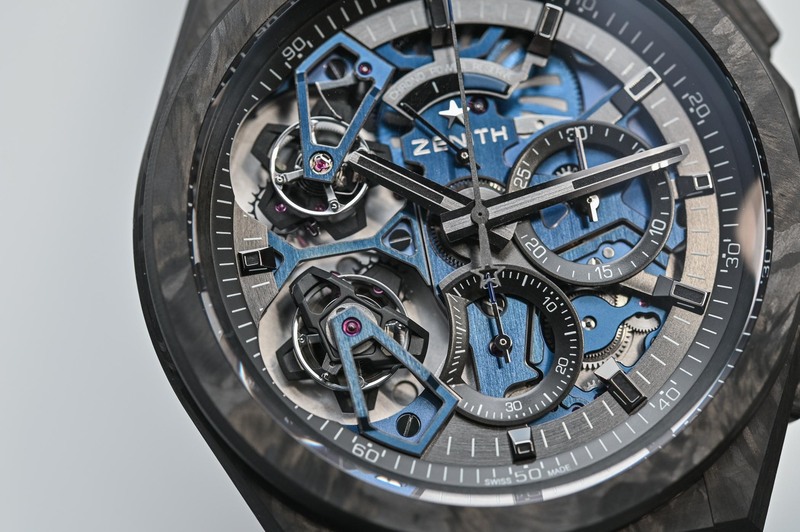 At Baselworld 2019, Zenith is back with an evolution of this watch, which is now equipped with two tourbillon regulators. 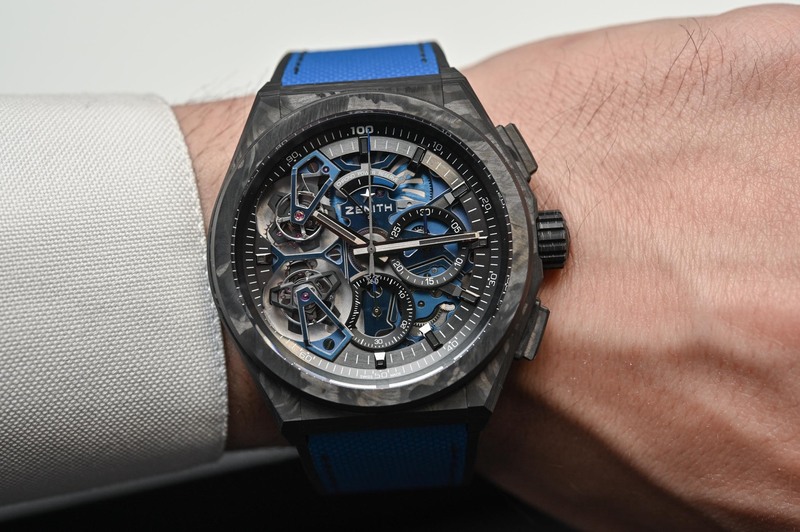 Meet the technically impressive Zenith Defy El Primero Double Tourbillon. 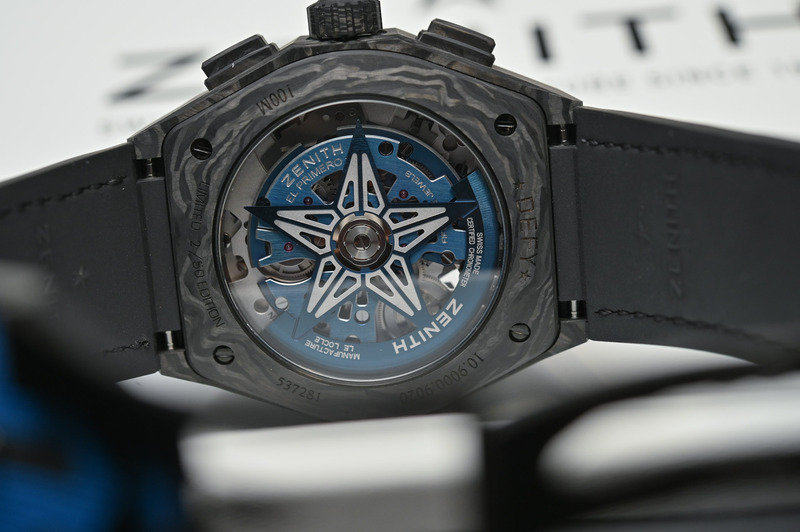 The model we had the opportunity to go hands-on with is a 50-piece limited edition in carbon – there’s also a 10-piece platinum limited edition. 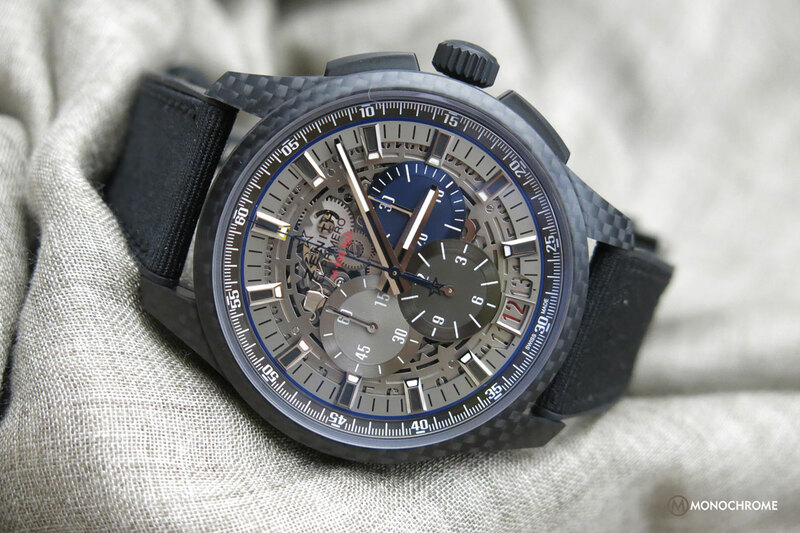 Both versions are powered by the calibre El primero 9020, comprising 311 components. This automatic movement features an original dual architecture. Most chronographs are based on a timekeeping engine to which the dedicated chronograph mechanism is engaged thanks to a clutch. Here, the timekeeping and chronograph mechanisms are entirely independent and autonomous. Each of them has its own barrel, gear train, and tourbillon regulator. Therefore there is no interaction between the timekeeping movement and the chronograph. As a consequence, when the chronograph is started and its mechanism engaged, there is no loss of amplitude (the rate of the timekeeping movement is unaffected) and no interference in energy consumption. The timekeeping movement runs at 36,000 vibrations per hour or 5Hz and is based on the El Primero (barrel, going train, escapement). Its power reserve is of 50 hours. The chronograph movement operates at the impressive frequency of 360,000 vibrations per hour or 50Hz and required an entirely new development. It measures and displays a 1/100th of a second. Its tourbillon carriage performs one rotation every 5 seconds, driving the chronograph hand at the amazing speed of one full turn of the dial per second. The seconds are counted at 6 o’clock and the minutes at 3 o’clock. 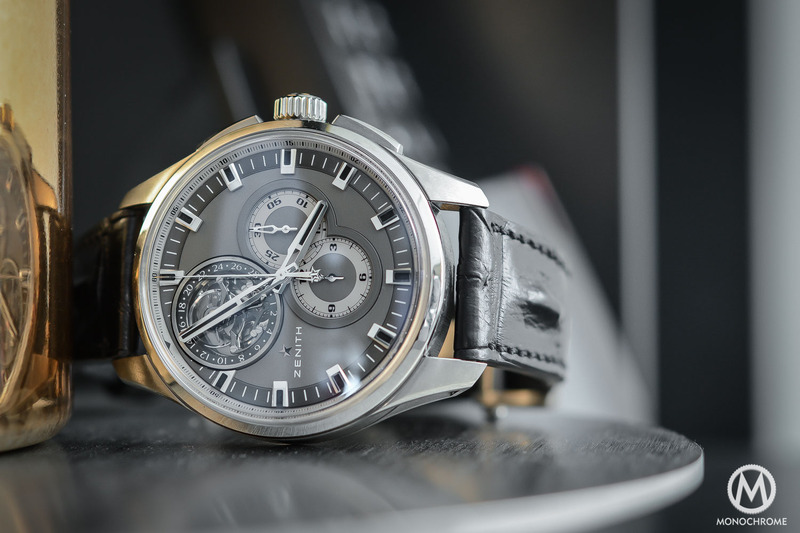 The power reserve for the chronograph is of approx. 50 minutes – which is displayed at 12 o’clock. 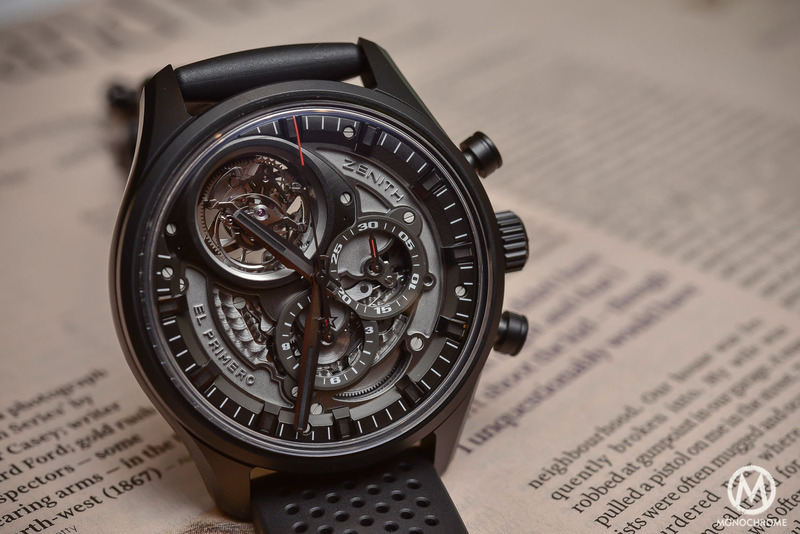 Check out the video at the top of this article to see the impressive motion of the two tourbillons and of the chronograph seconds hand. 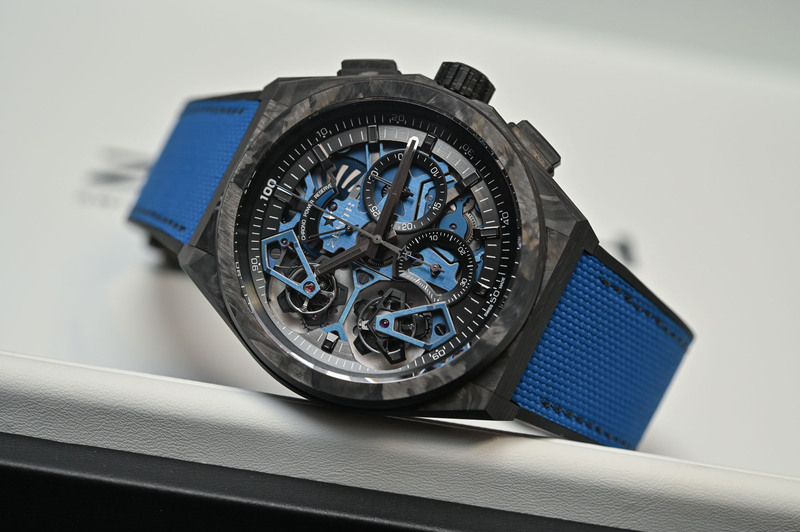 The Zenith Defy El Primero Tourbillon is a large watch, with a 46mm diameter. Not surprising given the complexity of the movement and its dual architecture. It stands out with vividly technical and modern aesthetics. 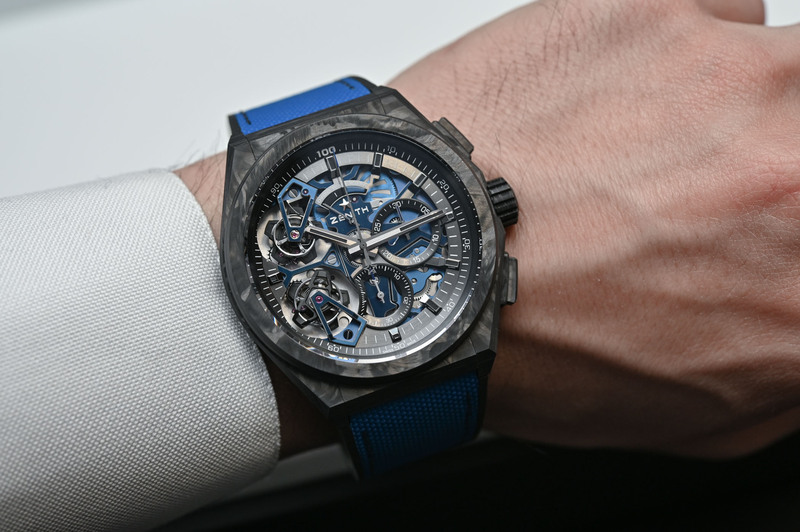 The angular Defy case is presented in black carbon (there is also a platinum version). The openworked dial is accentuated by a two-tone treatment. The exhibition caseback offers a nice view of the movement and its open star-shaped rotor. The case is water-resistant to 100m. Naturally, this statement watch has a strong presence on the wrist and is quite large on the wrist. Still, it wears superlight thanks to its carbon casing. It is fitted with a Cordura-patterned blue rubber strap with a titanium/carbon folding buckle. The platinum version comes on a black rubber strap with alligator coating and is secured to the wrist by a titanium and white gold folding buckle. Price is set at CHF 119,900 in carbon and CHF 149,900 in platinum. 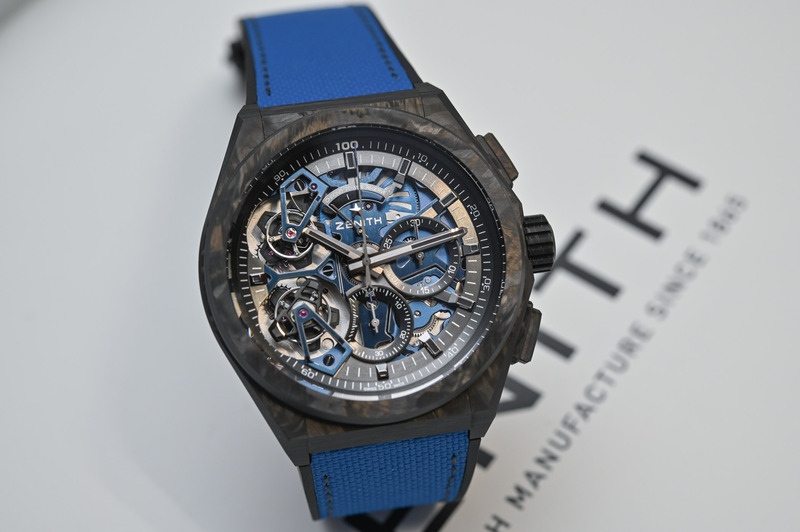 For more information on Zenith, visit www.zenith-watches.com. Hate the case, but the tech is clever. However, 1/100th of a second: really??? Average reaction times are about a quarter to a half of a second: just nuts without electronic controls. I am a Zenith fan, but nearing 50 years old I have to ask if form does not follow function anymore? Are they still in the same zip code? What is the point of making a 1/100th second accurate Chronograph that you can’t even read the elapsed minuets on…..
My Captains Chronograph dissapoints in that hour register reads in halfs….so by default if its not on the next line its less than 30. Thats not a very easy way to interpret a dial. This watch is on a whole nother level of undecipherable! But Bravo Zulu for the tech achievment. And sure there are tons of “statement pieces” that do lots instead of tell the time, but this one misses the mark in my opinion. Impressive technology. Why are so many of these very expensive watches so hideous. I suppose it stops envy. Ridiculous piece and price. Just because you can design it on your lap top doesn’t mean it should fabricated. Maybe the Zenith app version for $2.00 is next. Let the public take it for a virtual spin. That way we can avoid the inevitable buyers remorse. Very nice. Would still prefer the FP Journe Centigraph / Centigraph Sport over this but I actually like the carbon and blue. Yet another pointless, ugly, overlarge, hideously expensive vanity exercise. I’m sure the Tech CEOs will love it dangling from their skinny wrists. Have we reached Peak Irrelevance yet? I’m looking at my Oceanus right now and I feel pretty good.